As you know I love Picasso and Tiffany stones, so this new discovery of the Red Creek Jasper is one I have fallen in love with too. Thank you for bringing me a few of those lovelies to add to my new designs. I have yet to organize my stones as I just didn’t have that many. I am to the point where I need a good system and I do like those Riker cases. Time to head over to Riker’s website and do a little shopping. It was so much fun to pick out stones for you. As for the number of stones, I have realized that I don’t have an inventory I have a “collection”. I hate to part with any of them. I’ll help you with your organization and inventory. Glad you like the Red Creek Jasper. I DO, TOO! I haven’t been this excited about a stone since the introduction of Picasso marble 15+ years ago. I think it will be really HOT at the Denver show. Hello! Thanks for sharing this. The patterns look similar to the Picasso and also to Indian Paint Rock (both of which I love, but don’t have much of). I’ve just cut some cabs from fossil palmwood, and since reading in your previous post that it’s becoming scarce, I think I’ll take more care from now on! Hi–and thank you for your comments. Yes, it was pretty scarce. Gray B. Wilson had some cabs of it, but the color was more of a taupe, really a dark color that I had not seen before. I bought one slab of the old color for cabbing, and found about 3 more, but the dot pattern was much larger. Cherish what you have. I don’t know how much is out there. Hi, Lexi. The large stone in the photo above is very similar to some stones I have bought as Multi-color Picasso Jasper. I saw some at an art fair we went to in Oct. The lady that had them said the stones came from a dig where they thought that turquoise might be found and this type of stone came up instead. A lot of the Chinese vendors have them. I don’t know how big the supply is for it, but there seems to be quite a lot of it available. Palmwood does seem to be pretty rare. I try to organize by both color and type. Beads by color, although some stones just go into the multicolor boxes, multi-color green, multicolor brown, etc . 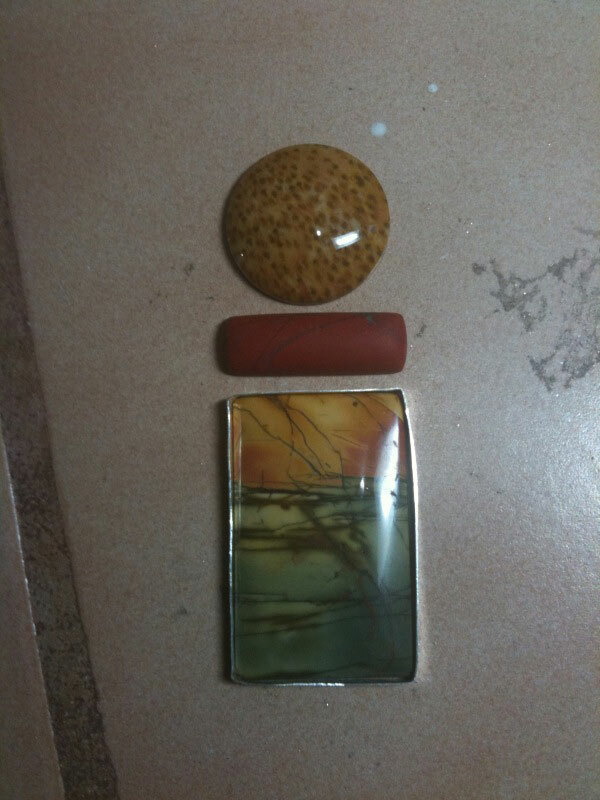 Cabs and focal pendant beads by type, Rhyolite, Ocean Jasper, Agate, etc., etc. For organizing bead, I like your idea. I think I will hang my strands by color, thought I have a rather restricted palette, mostly earth-tones. They will look nice hanging on a pegboard, and be really handy to work worth, plus fun to look at. Your box of small round stones is on its way to you. You should get it Monday or Tues regular mail. I hope you like, them, there were not many small round one and the ones I got were all the same size. Good to hear from you. We had snow last night, with more coming Sunday. You stay warm.